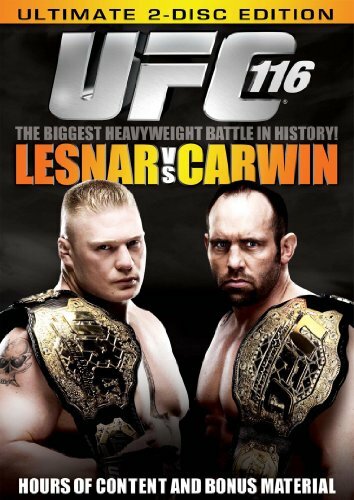 UFC 116 was one of those events that had an enormous amount of hype behind it. World Heavyweight champion Brock Lesnar was returning after almost a year on the shelf, having suffering a disease that was not just career-threatening, but life-threatening. He was returning to take on Shane Carwin, a man just as big as Lesnar and one that has never had an opponent make it out of the first round against him. When all was said and done, this card lived up to the hype and send everyone home more than satisfied. Regardless of who you wanted to win, you could not deny that most of the fighters on the card gave it their all. Brock Lesnar survived a brutal beatdown for almost three minutes of the first round. Shane pinned him against the cage and it looked like it was simply a matter of time until ref Josh Rosenthal stopped the bout. Watching it again, on DVD, I can see that Brock a pretty good job of blocking most of the blows. So the start of the second round saw a battered Brock score a takedown.. At the start, it was clear that Shane had used up most of his gas trying to put Brock away. After the takedown, Brock moved methodically from side control, to mount and eventually to the other side as he secured a side choke to end the fight at 2:19. Brock showed humility, something that has been missing in the past and said he was “blessed by God” to have returned from his medical ordeal. The co-main event was supposed to be Wanderlei Silva taking on Yoshihiro Akiyama. Silva suffered broken ribs, but kept training. He then sustained a knee injury that required surgery and was forced to pull out of the fight. Chris Leben, having fought just two weeks earlier, agreed to step in and face the very dangerous Korean fighter. The bout was an exhilarating bout that saw each guy rock the other. Most than once, the bout appeared to be about to end, only to have the losing fighter bounce back. As the last minute of the third round ticked away, it looked like Akiyama would pick up a 29-28 win, but Leben snared him in a triangle choke with just 20 seconds left to go. His post-fight speech had the entire arena rocking and almost certainly elevated him to headliner status. 1 Jon Madsen earned a unanimous decision over Karlos Vemola. 3 Gerald Harris sent Dave Branch into la-la land with a massive slam at 2:35 of the third round. 5 Ricardo Romero staged a comeback and submitted (Armbar) Seth Petruzelli after Seth gassed out at 3:05 in the second round. 6 Brendan Schaub TKO’d (Punches) Chris Tuchscherer at just 1:07 of the first round. 7 George Sotiropoulos out-worked Kurt Pellegrino to earn a unanimous Decision. 8 Stephan Bonnar stopped Krzysztof Soszynski (TKO via Punches) at 3:08 of the second round. 9 Chris Lytle subbed (armbar) Matt Brown 2:02 into the second. 10 Chris Leben caugh Yoshihiro Akiyama in a Triangle choke with just twenty seconds left in the third round. 11 Brock LesnarShane choked out (Arm-triangle) Shane Carwin at 2:19 of the second round. The extras offer up a look at the sound and video crews and how they put together the event. We also see the fighters talk about the stare-downs. Some pay little attention to them, while others see it as a chance to gain a psychological advantage over their opponent. UFC 116 is a must own. Top to bottom, the fights deliver, with the fights split fairly even between decisions, submissions and KO/TKOs. Well worth the money, this is one that I will revisit many times in the future, if only for Leben/Akiyama.